Infant Colic Symptoms - How to Recognize and Deal with them. Having a baby is one of the most joyous experiences of a new parent's life, but meeting the needs of a newborn baby can be a challenging and intense experience. This is especially true for parents of newborns who display colic symptoms. Fortunately, your baby will eventually outgrow these symptoms. In the meantime, there are several steps that you can take to deal with infant colic. 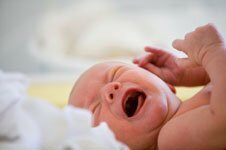 So, what exactly is colic? Colic essentially means that your baby has prolonged crying episodes that may last from one to four hours. This typically happens during the evening hours, and you may notice a shrill, continuous, loud cry. Some babies will pull their legs in toward their bodies, grimace, or hold their breath and flush bright red. My youngest's episodes of colic would start at three in the afternoon and last until one or two in the morning! Experts still don't know what causes colic. Some babies appear to be in pain during a crying jag, while in others the cause is unidentifiable. Some issues that can aggravate infant colic symptoms include eating too much or too fast, swallowing too much air, gassiness, failure to burp the baby, or allergies to certain foods. The psychosocial environment of the home may also play a role. An angry or tense mood, or even excitement or frustration, can increase the odds of a colicky spell. So, you know what colic symptoms are, now how do you go about relieving them? First, try removing offending foods from your diet if you are breastfeeding. Avoid consuming caffeine, and foods that may cause gas like cabbage, beans, onions, and citrus juices. Try eliminating dairy foods from your diet to see if your baby may have a dairy sensitivity. For formula fed babies, try switching to a different formula if your baby seems overly gassy. Also make sure you aren't over or under feeding your baby. The primary way to gauge this is to make sure he has the correct number of wet and soiled diapers each day, and to monitor his weight gain. Whether your baby is breast or bottle fed, burp him after a few minutes or a couple of ounces. Also, sit him in an upright or semi-upright position after eating. Repetitive motion can be an effective comfort measure. Try a baby swing, rocking cradle, or rocking chair. You can also put your baby in a stroller for a walk out doors, sway and dance with him in your arms or in a sling-style baby carrier, or go for a drive in the car. We used a swing for our little one and that worked great. If your baby's colic symptoms are caused by gassiness, try holding him in a position that will help him release the pent up air bubbles. You can drape your baby over your arm in the "football" hold, with his head in the crook of your arm, his belly supported by your forearm, and your hand supporting his bottom. Or, try the "colic curl." To do this, hold the baby facing you in a semi-reclining position. You can lean the baby back against your drawn-up knees, or just support him with your forearm in a semi-upright position. Make sure his knees are loose and bent, and gently press his feet against your chest. Warm compresses in the abdominal area can also help relieve infant colic symptoms. Try using a hot water bottle wrapped in a towel or receiving blanket, or a heating pad on the lowest setting. Be sure to monitor the temperature carefully to avoid burning your baby. Soothing sounds can also help relieve colic symptoms. Soft music, or white noise like a fan, vacuum cleaner, or clothes dryer can help. Chamomile tea has long been known as a digestive aid that calms cramping and eases the pain of gas and other digestive upsets. It's generally safe to give an infant chamomile tea, but you'll want to talk to your doctor first to make sure this is okay. While dealing with infant colic is no picnic, remember that this too shall pass. Don't think that you are an inadequate parent if your baby continues to cry, no matter what you do. Sometimes the only way to deal with colic symptoms is to wait them out. In the meantime, try these techniques, and you may hit upon something that will provide your baby with a measure of relief.